Neenah High School sophomore Andy Becker was invited to compete at the Grand National Sport Kite Competition in Dayton Ohio at the American Kitefliers Association Annual Convention earlier this year… Andy qualified by ranking among the top three competitors in the 2003 Midwest Conference in three events, Experienced Multiline Precision, Experienced Multiline Ballet, and Open Individual Freestyle. Andy is taking advantage of this wide public contact and has chosen to ‘fly for a cause’ by dedicating his entire flying season this year to raising awareness for Celiac Disease – a medical condition often known as gluten intolerance for which he was recently diagnosed. 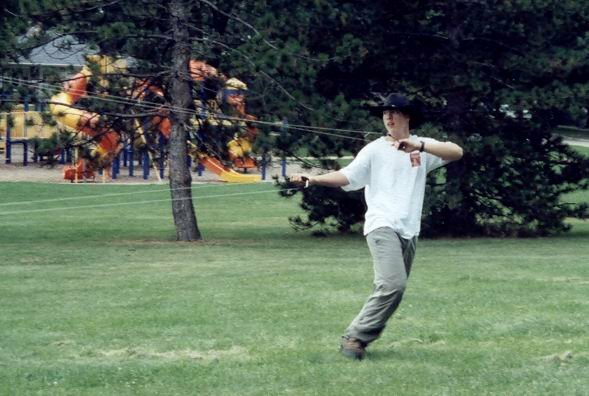 If you ask Andy how he came to flying with his feet – a unique kite trick which qualified him for the National Sport Kite Competition – he will tell a remarkable story of commitment, perseverance, and the effects of undiagnosed celiac disease which include weakness, fatigue, and anemia. Kitelife: Andy how did you first get started in kiting? Andy: My Grandmother, MaryJane Murphy was a kiter with the Chicago Skyliners kite club—she got me interested and brought me to several kite festivals in Illinois and Wisconsin. She talked a lot about kiting and the many people she met. She had several kite making books, so my mother made me a dual line kite and I taught myself how to fly it. 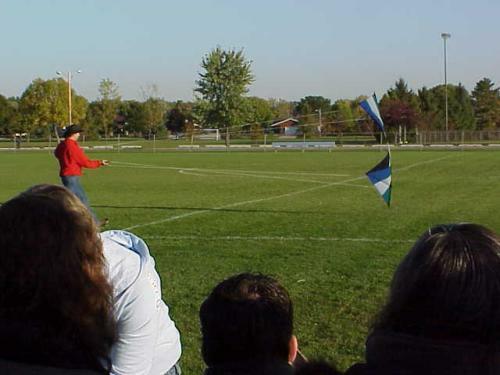 It was a real “dorky” kite—a bit primitive—it had no real trick capability…but I was flying. Kitelife: How did you begin competing and performing? 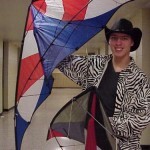 Andy: About a year ago, several people I met at kite festivals suggested I put together a routine and begin competing. I really had no idea what to do, but was ready to try it. My first competition had no wind. I showed up with two kites—that’s it. I had a dual-line and a quad-line. I had to borrow kites to fly in no-wind and managed to pull off a ticket to the Nationals in Dayton last year—flying on a borrowed kite in no-wind—something I have never done before. Kitelife: I understand that you are flying for something special—can you tell us more about that? Andy: I am flying for Celiac Disease awareness. Celiac Disease is an allergy to gluten, which is found in wheat, barley and rye. I was recently diagnosed and I hope to raise awareness of this disease so that others who may have it, or know someone who has it will learn more about it. I have information from the University of Chicago Celiac Disease Program which I distribute at the kite festivals to anyone who is interested. 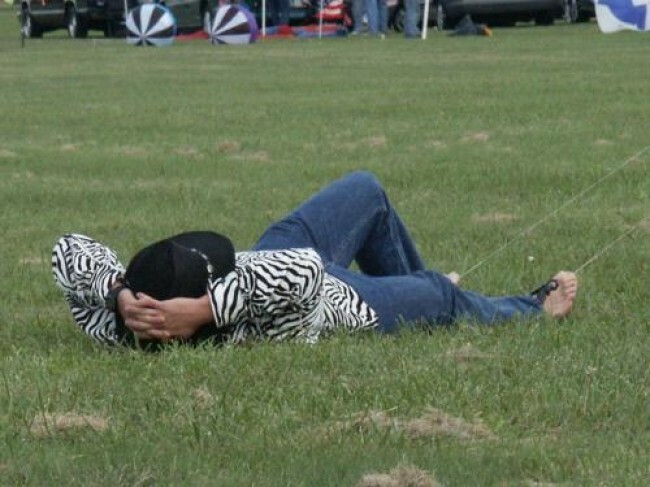 Kitelife: How has kite flying helped you cope with this disease? Andy: It gives me a sense that I belong and have purpose—I feel a sense of success. Before I was diagnosed, I was very sick all the time–I was so weak and tired. I was in wrestling and other sports at school but I could not compete because I was so weak. Kiting is my sport now—I enjoying competing and traveling…and meeting the kite people from all over. Kite people are very understanding and accept me for who I am—I don’t feel so different—I feel that they care about me. Kitelife: Tell me more about your experiences with the “Flying-Free, Gluten-Free” for Celiac Disease Awareness? Andy: Kiting has given me an opportunity to meet many people in the communities in which I fly. The more people I tell about Celiac Disease, the better I feel because I may be helping someone who is struggling or suffering like I had…not many people are aware of this disease; even my doctors were surprised when it was finally diagnosed. It is a genetic disease, which means that most families would already know about it and recognize the symptoms in their young children. However, no one in my family had ever heard of this disease—since my diagnosis, my mother subsequently tested positive and with the new diet has resolved years of digestive health issues…and I believe my grandmother may also have unknowingly had the disease. So I want to share my story with other people who may have it and not know it. Kitelife: How did the kites and Celiac Disease awareness come together? Andy: The idea began because I was looking for a community service opportunity for my Boy Scout Eagle project. I thought that since I spend every summer weekend in a different community throughout the Midwest flying kites that I could somehow use that public contact to do something good for others. I had been recently diagnosed and was learning a lot about the new diet and the disease, so I decided that I would dedicate my performances to raising awareness for Celiac Disease…I would ask the announcer to mention it before I fly and anyone with questions could see me for more information…I give out brochures from the University of Chicago Celiac Disease Program to anyone who is interested. Kitelife: What kind of response do you receive at these events? 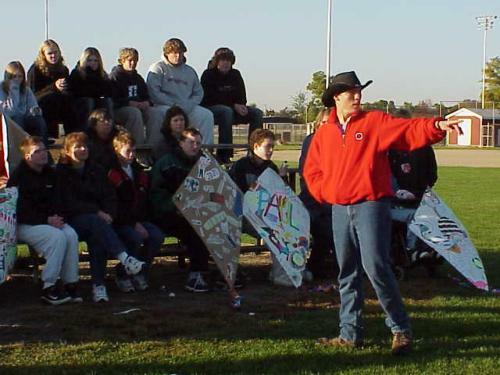 Andy: After I fly, there are usually several people waiting for me as I leave the field—many people who have, or know someone who has Celiac Disease, others who think they might have it and just want to talk with me. Some people have even contacted me later to say that they tested positive and are on the diet—adults who went their entire lives not knowing why they were so sick. Honestly, the “Flying-Free, Gluten-Free” has taken on a life of its own—I feel like I am in the right place, at the right time…it is really awesome…It has given me something outside of myself. When I am competing, it gives me something to focus on. As a result of my flying, the University of Chicago Celiac Disease Program has received many calls from people looking for more information…I think this is great…maybe someone can get help and know that they are not alone. Kitelife: Andy, I know that you were competing in the AKA Nationals at Dayton this past year…what have you been doing since then? 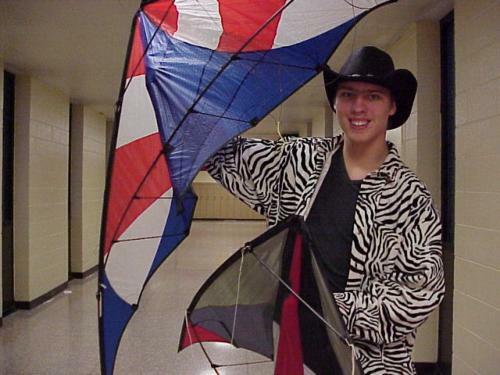 Andy: When I returned from Dayton, I was asked to show my kites and fly for a group of disabled students at my school who were making their own kites in art class…they had heard that I was a kiter and wanted to see me fly. 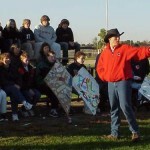 It was a lot of fun working with these students—most of them had never seen kites like mine and were quite interested. 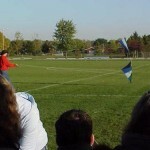 I started a kite club at my school—we are hoping to get several teams together for next years competitions. We also plan to perform at fairs, football games, and school assemblies. 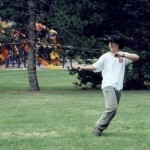 We are called the Neenah Rocket Fire Kite Club. I am also working with a student club that has asked me to teach kite making and perform at the annual Diversity fair. I am also working with the Madison Universal Flyers who received a grant from the Council for Developmental Disabilities to work with disabled community members on kites and flying. It is certain to be a rewarding experience. As I work towards my Eagle in Boy Scouts, I hope to put together a proposal for a Kiting merit Badge so that other scouts can learn and enjoy kites as much as I do. I plan to take a leadership role at KOI in February—I hope you can be there. I am attending the MAKR this year so I can learn to make my own kites. Kitelife: Is there anything else you would like to tell our readers? Andy: I hope to see you all in Seaside next year! feel free to visit the University of Chicago web site. This entry was posted in 2003, Issue 33 (Nov/Dec), KL Archive and tagged andy becker, interview, profile.